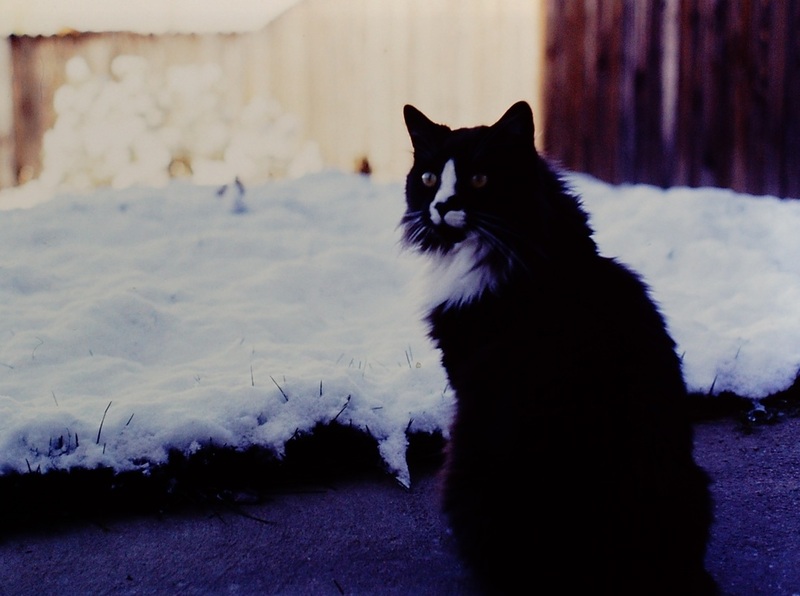 Charlie was the best cat ever. Brenda found him in a dumpster in an apartment complex. His fur was one solid mat. She brought him home, and we had to shave off all of his fur because it couldn't be groomed. We put up fliers in the area where we found him, trying to get him back to his owners, but I secretly hoped we wouldn't find his previous owner. He was the sweetest, smartest cat, friendly and talkative. It's not like we needed another cat because we already had Gizmo, Duck, Heidi, and Tanzy, at the time. Charlie slept in a drawer in the bathroom for about a week while the other cats got used to his scent through the gap under the door. The drawer was lined with a towel. He was skin and bones after his matted fur was shaved off, so we began to call him Bones. Eventually we called him Bonesy, although I have no idea how that should be spelled. After a couple of weeks of searching for his owners, unsuccessfully, Bonesy was fully integrated into our family. Except, Gizmo didn't really like the fact that Bonesy liked to sleep right against my chest every night. Gizmo wanted that spot. Bonesy had a way of just pushing Gizmo out of the way, not mean but insistent, and Gizmo let him. Poor Gizmo was my first cat that I had as an adult, but he was always annoying. I loved Gizmo, and I tried to show him just as much affection as I showed Bonesy, but he had an annoying meow, he always stepped in the wrong place when climbing into my lap, and he was often in the way of whatever I wanted to do. Through no fault of his own, Gizmo always seemed worried or distressed, where Bonesy lived in a large world of opportunities and ideas, adventures and exploration. Bonesy had a pleasant meow, but he also had a whole vocabulary of words. He would speak in complete sentences, explaining elaborate ideas and series of events. Although I never understood Bonesy's words, it was clear that he had specific ideas in mind, and that he wasn't just making random noises. When his fur grew back, he was so soft and beautiful. Bonesy would greet me when I came home, rather like a dog. Even though Brenda was the one that rescued him from the dumpster, Bonesy always slept right against my chest. Bonesy came to us in Colorado in '92, I think, and he moved with us to Seattle in '94 or so. 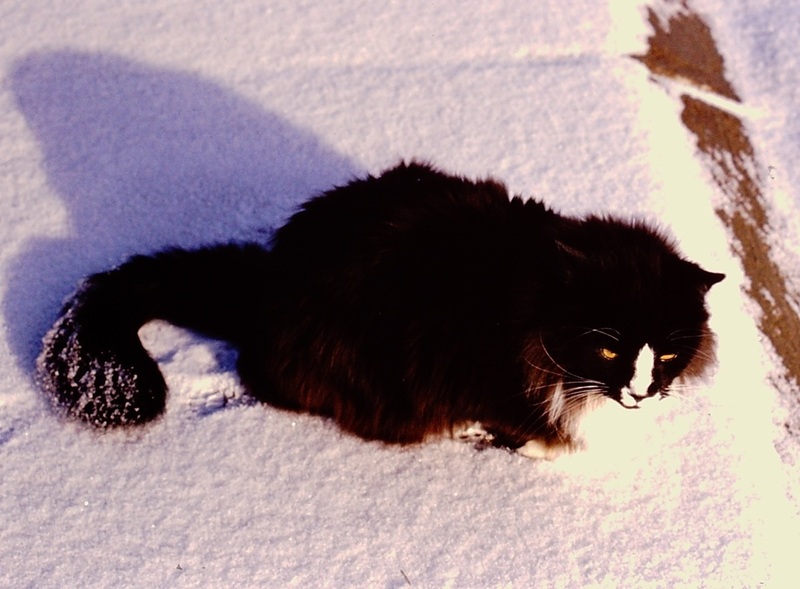 In Colorado, we tried to keep him indoors, but he clearly preferred to go outside for adventures. We started letting him out for limited times, and he enjoyed exploring the neighborhood. I later learned that he would go into the neighbors' house, through their cat door, and go into the kitchen to chase away their two much-larger cats and eat their breakfast. Our neighborhood had a storm drain system that had a large capacity for storm rains but was dry most of the time. Bonesy would hop down into the storm drain by our house, and I could hear him meowing as he wandered around his subterranean world, eventually popping out half a block away. One night when we came home late, Bonesy was sitting by the front door, but he didn't greet us with his usual friendly words. When we looked closer, we saw that he had a head injury, possibly from being hit by a car. We rushed him to the vet. There didn't appear to be any permanent damage other than the bloody gash. He healed quickly and seemed to be his old self in a few days. We wanted to keep him indoors, which was very much against his wishes. We tried to keep him entertained indoors. I remember that we got him a box of catnip, and he wandered drunkenly around the kitchen with the box on his head, bashing into the cabinets. When he would hit an obstacle and fall down, he would pull his head out and look around, and then shove his head back into the box and wander a new direction. I built an enclosure for the cats so that they could go out through the cat door and explore a portion of the yard contained within a framework of wire mesh. This worked for a while, but Bonesy spent all his time trying to bend the wires of the enclosure and escape. Gradually, we started letting him out again. When we moved to Seattle, to a house in the woods, Bonesy was once again enjoying full access to the outdoors. 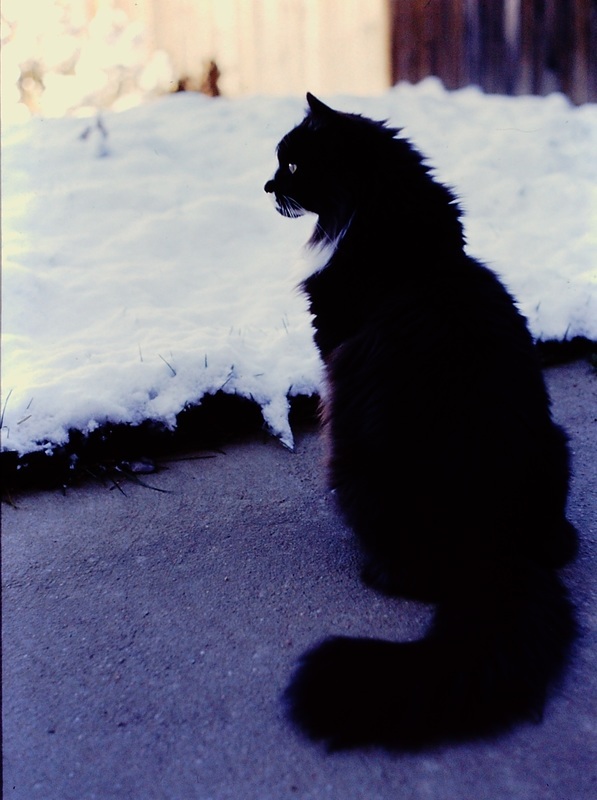 He loved to explore the woods, and he would sometimes go over to the neighbors' house to say hello. We had a routine where Bonesy would stay out in the evening, and then after we went to bed and turned out the lights, he would jump up on the roof at the low spot, walk along the ridge, drop down onto the deck, and ask to be let in the window. I would let him in, and he would burrow under the covers and sleep against my chest, with cold in his fur and the smell of the woods. 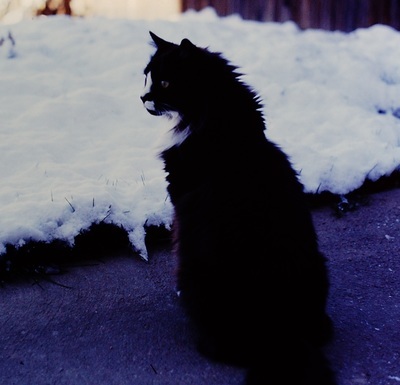 In '97, I think it was late summer, Bonesy didn't come home one night. I can't remember a single night that Bonesy failed to come home before then. The next day, we put up Lost Cat fliers in the neighborhood. We got a few leads of a similar cat half a block away, but it turned out not to be him. We used a service that called every home within a certain radius, for a fee, and played an automated message telling about our lost cat. I don't know if those calls ever actually went out, but at any rate, we never got any leads from that service. We searched the woods many times, during the day and with flashlights at night, looking for eye reflection. We never did find him, and we eventually gave up looking. I didn't know the proper ways to look back then, and Kat Albrecht had not yet pioneered all the techniques of finding lost pets. He was just gone. The remaining five cats--Heidi, Gizmo, Duck, Smookler, and Wolfgang, became indoor-only from that point on. Bonesy was my favorite cat ever, and I lost him. Knowing what I know now, I would have tried harder to keep him inside, even if it made him unhappy. I wouldn't want to break his spirit, seeing how much he enjoyed his outdoor adventures, but going outside is just too risky for a cat. Where we lived, I knew that we had Great Horned Owls, although I was unaware at the time that they could target cats. In hindsight, it was a very bad idea for Bonesy to have the routine of walking along the ridge line of the roof every evening after sunset when Great Horned Owls were known to live in the woods. Owl attacks are rare, but my dogs have found the aftermath of an owl attack during a few of our searches for lost cats. If I had known then what I know now, I would have been able to prevent losing Bonesy, or I may have been able to use the proper search techniques to find him, the best cat ever. Losing a pet is part of pet ownership, since you will have to let them go someday. I've said goodbye to Tanzy, Heidi, Smookler, Wolfgang, Duck, Gizmo, Olive, Norbert, Porter, and Tess. It never gets any easier, but at least I had a chance to say goodbye to them. Bonesy was there one day, and then simply gone. Worse, I knew then that I was at least partially responsible, and I know now that I probably could have prevented it. When Kelsy and I started training to find lost pets in 2008, losing Bonesy was certainly one of the motivating factors. Our knowledge and experience can't help Bonesy, but it can help someone avoid the pain we went through.